How does Ms. Bouchard involve her students in establishing the learning goals and success criteria? What observations does Ms. Bouchard make during the discussions? How does Ms. Bouchard help the students assess their own learning? Ms. Bouchard involved her students by letting them take control of their learning. She allowed for them to discuss and assess themselves and she listened and clarified things for them to see if they understood before they moved on. They worked in collaborative groups which led them to ask and answer questions of each other so they got to be teachers as well. Ms. Bouchard has the students come together to work collaboratively to make discoveries. She sets up an atmosphere that makes the students feel comfortable and confident; thereby producing excellent responses to the task at hand. How does Ms. Bouchard involve her students in establishing the learning goals and success criteria? What observations does Ms. Bouchard make during the discussions? How does Ms. Bouchard help the students assess their own learning? Ms. Bouchard begins with having the groups look at the poster and come up with ideas collaboratively to answer and assess their own understanding and their groups understanding. 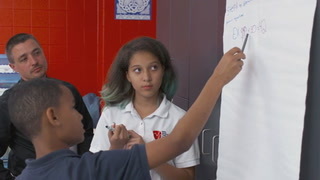 She continues to point out students that are working well together and asks questions to clarify and redirect students when needed to keep the learning flowing toward achieving their learning goals. How does Ms. Bouchard help the students assess their own learning? Ms. Bouchard allowed the students to share their own ideas by determining what the meaning of the word is. After they were done they had discussions about what they did and what the defined meaning of the word is. Kelly: So do you have any ideas like that on here? Student: Collaborative also means what you said, but it also means like to work together. Student: You should not talk when another person's talking. Kelly: So today we are going to be talking about what makes a group discussion really effective and what it means to collaborate in a small group. Kelly: My name is Kelly Bouchard. I teach fourth grade at Alan P. Hubbell School in Bristol, CT. On your desks in front of you in your table groups, I put a poster. When I take a look at some of the questions that we have on that poster, take a look at number one. Student: What does the word "collaborate" mean? What makes a discussion collaborative? Student: What does it mean to build on others' ideas? Kelly: In the clarify piece, first the kids worked together to come up with ideas of what they thought a collaborative discussion was. When you come up with an answer to these questions, you're going to write it on your post-it note and put it right in that box, so that we can keep track of all of your smart ideas. Go ahead and get started. Student: I think collaborate means work together, teamwork. Basically, it's trying to write [ph?]. Kelly: I was just kind of trying to listen in and make sure that everyone was getting a chance to talk, that it was their ideas. I didn't want to add too much to their discussion because I wanted them to really own that and have it be their own. Student: I think collaborate means that maybe to share ideas with other people. Kelly: I stepped in if it seemed like the kids didn't know what the questions were asking them and kind of got them back on track in that way, but I really let them have their own conversations. 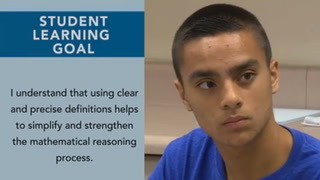 Students: What questions can you ask to better understand your classmates' ideas? Student: You could ask, "What do you mean?" Kelly: And then I introduced them to the learning targets and to the success criteria. I understand that building on others' ideas helps create collaborative discussions. I can ask my classmates questions to better understand their ideas. I can link my ideas to my classmates' ideas in collaborative discussions. need to decide which post-it note best answers that question, and you're going to write it down on a sentence strip. Students: Make eye contact so they know you're listening. Kelly: So what do you guys think? How can you create a collaborative discussion? Student: I think asking, like, "What did you do this week?" and then they say, "I went to this haunted house, somewhere, so and so," and then you could just keep going. Kelly: So asking questions and listening to what other people are saying? Those are good points. I'm going to have a couple of you share the ideas that you wrote on your sentence strip. Haley, go ahead. Haley: Make eye contact so they know you're listening. Carolyn: You can say, "I don’t understand it. Can you say it again?" or "What do you mean?" Kelly: I think it was effective because the kids kind of felt like they owned that success criteria, like we had all come up with what was going to make a collaborative discussion. Student: Oh, we just collaborated. For more information about clarifying the intended learning for this task, go to the Toolkit section of this module. Kelly: We have been reading "Tuck Everlasting" together as a class. So today we're going to practice some of these things to have a collaborative discussion about "Tuck Everlasting." If someone says something that you agree with or disagree with, you can use those words to link your ideas together. You can say, "I agree," or, "What about this?" So you're going to use all the things that you just talked about to have a really good discussion about our book, okay? Kelly: Before we started the eliciting evidence section, I kind of went over the success criteria again and told them specifically what kinds of things would help them meet those success criteria. I am going to post a question up here and you guys are going to have a really good collaborative discussion about this question. And then I gave them the first question and they were able to kind of try that out with that in the back of their mind. I'm going to give you just a couple of minutes to talk about it and then we're going to check in on how we're doing, if we're asking each other questions, if we're linking our ideas to each other. So here's the first question I want you to talk about. Winnie learns an incredible story from the Tucks. How would you have felt about it? What would you have done? Student: I'll probably wait till I'm 20 so I could spend the rest of the time with my family and then when I drink the water, I could spend time with those people, so I still have time with my family. Student: I'd actually probably want to do that too, because I want to see other things. Kelly: While they were discussing the questions, I walked around and wrote down evidence that I saw of them using the success criteria. questions. What might happen if the secret was revealed to the public? How would people's lives be changed for the better or worse? How would society be affected? Student: You would still live but it would really sad. Student: I agree with that, because people would not think about that, when they just drank it. Kelly: I think that using this formative assessment process is a big shift in teaching because maybe if I wasn't using this in this lesson, I would have just given the kids a bunch of questions to talk about and not really checked in and not listened in to see if they were actually doing things. But I think it will also shift into not only this small part of the day, but when they're having any kind of discussion, which was what I had focused on, they're going to be thinking about those things in the back of their mind. Student: I think if the secrete was revealed, everyone would take a drink and no one would ever die. For more information about eliciting evidence for this task, go to the Toolkit section of this module. Kelly: What might happen if the secret was revealed to the public? Student: If the secret of the fountain was released to the public, then well that would be bad. Kelly: Today's lesson was about collaborative discussion. Kelly: I gave the kids questions about a text that we had been reading together to answer in their small groups. So while the kids were talking, I was interpreting the evidence by walking around and listening in on their groups. Charli: I think people are just going to go around, being a wild pack of wolves, trying to search for that water. Charli: Today we were discussing how to collaborate with other students in the classroom. Student: I'd be so shocked, that I would just stay with them, but I don't know if I should drink the water or not. So I would just drink it to see what it does. classmates questions to better understand their ideas, and link our ideas to our classmates' ideas, using those linking phrases. So some of you, I heard you saying things like, "I agree, I disagree," or things like, "Yeah, I think that too." I didn't hear too many kids ask questions. Some of the questions that you guys wrote down were things like, what made you think that, or why do you think that? That's going to help us better understand what our friends are thinking. Okay, Kayden? Kayden: They let the person asked the question. You didn't get it, so maybe should ask him the stuff before going on, because then you're going to be like, "I don't know what he meant." Then if he keeps going, you still won't know. feel like they have ownership in what they're doing and they can say to themselves, "Oh, we're supposed to be asking each other questions. We're supposed to be linking our ideas." You were asking more questions so that you could understand their ideas? Student: Yeah. I asked Michaela, what if they didn't want to live forever? Kelly: Nice. All right, go, you can get your ideas down. For more information about interpreting evidence for this task, go to the Toolkit section of this module. Kelly: What do you think we need to do before we answer the next question? What are we going to work on as a class? Charlie? Charlie: Try to ask each other more questions because we're pretty much all saying our own thing. Kelly: Today's lesson was about collaborative discussion and the formative assessment process, so it allowed myself and the students to act on feedback immediately, based on what was happening in the lesson. I heard a lot of kids sharing their own ideas, but ask each other questions about that. Student: If it did change the people's lives forever, they probably wouldn't mind. Student: Why do you think they would want to live forever? Student: I probably would think, they probably would like to live forever, instead of dying, and losing their family members or something like that. Kelly: Based on what we talked about before you started this question, how did you change your group discussions? Michaela? Michaela: At first when we did our first question, we really didn't ask a lot of questions, but for our second one, we asked a couple of questions. Charlie: People were asking a lot of questions, because we all had really weird ideas about what would happen. Kelly: So you were asking questions about your ideas? Kelly: Okay. Taylor and Anthony are going to pass out a self-reflection for you guys. Please put your name on the top. The students completed a self-reflection sheet on how well they felt they had met the success criteria and they had to give examples. I went around using the notes that I had taken before to kind of check in with some of the kids how they thought that they did. Did you link your ideas to anyone else's ideas? Mm-hmm, yeah, when I was listening in, I heard you say things like, "I agree,"
and then at one point you said, "Yeah, that would be amazing." Student: We kind of did to Rihanna's idea. down what you're going to do next time, so what your own personal goal is for next time we have a group discussion. I think a lot of times in lessons, you just kind of go and go and you might not have that opportunity, where this really allowed me to see, okay, if I just say this or ask the kids this, we can turn this completely around and we can have another strength by the end of the day. What do you think we need to do as a class to get even better at having collaborative discussions? David? Student: Maybe listening to each other and try to make the group's answers better. Kelly: I think the bottom line is that kids feel like they have ownership in their learning and the teacher also has this powerful tool that they can use to address their instruction in the moment. You guys did a really nice job of asking each other questions about what you were saying and also adding to each other's ideas. For more information about acting on evidence for this task, go to the Toolkit section of this module.